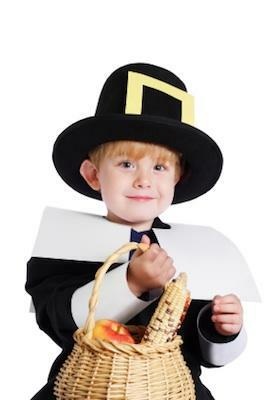 Costumes are a great way to get kids engaged in learning about Thanksgiving. From preschool pilgrims to adorable turkeys, there are lots of fun dress-up ideas to help the youngest kids celebrate this fun holiday. Some of the costumes are also perfect for kids to make themselves. Making pilgrim costumes is easy, and these instructions allow kids to get in on the fun. They'll need some help from adults when it comes to cutting, stapling, and gluing everything in place. Click on the diagram to the right for step-by-step visuals. Help the children wrap the black cardstock rectangle around their heads to get the perfect fit. Mark where the rectangle overlaps and staple it at several points to hold it. This tube will be the upper part of the pilgrim hat. Have each child cut slits along one end of the tube, making each slit about one inch long. It may help to make a few slits yourself for the child to copy. These slits should be 1 to 2 inches apart and go all the way around that end of the tube. When you're done, there will be a fringe around that end. Bend each piece of the fringe back about 90 degrees and crease. Stand the tube up so that the fringe is on the top. Place the tube on a piece of black cardstock and trace around it with a pencil. Cut out the circle you traced, making sure you cut slightly outside the line. Apply a line of glue to the edge of the circle. With the fring side up, press the tube down on the circle. Make sure the glue touches both the edge of the tube and the circle. This will be the top of the hat. Apply glue to each piece of fringe. Center the 14-inch, pre-cut cardstock circle on top of the fringe and press down lightly. Allow the glue to dry. While you're waiting for the glue to dry, cut a rectangle out of yellow construction paper. Cut the center out of the rectangle to form a buckle. 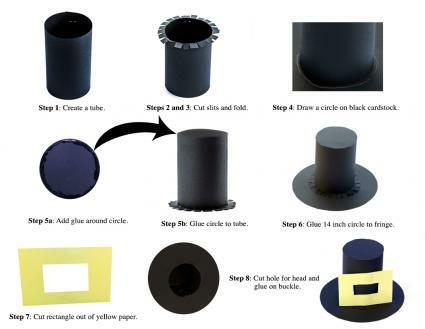 When the hat is dry, cut the center out of the large circle so the child can put the hat on. Glue the buckle to the front. Slightly round the corners of a 12 x 18-inch piece of white construction paper. Cut a slit in the middle of one side, stopping when you reach the crease in the center. Cut a small oval in the center of the collar, just slightly larger than the child's neck. Use a hole punch to make a hole in each corner at the front of the collar. Tie a piece of yarn through each hole. To wear, slip the collar over the child's shoulders and tie the yarn ends together. 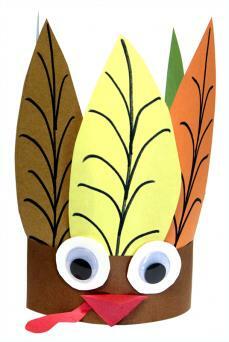 This paper pilgrim bonnet and apron are perfect for preschoolers to make. They will need a bit of adult help with the stapling and cutting. Click on the diagram to the right to see the steps in progress. Before the kids begin working on the bonnet, cut a 12 x 18-inch sheet of paper down to 11 x 17 inches. Use the ruler and pencil to measure about 5 1/2 inches from one corner on one of the 17-inch sides. Make a mark there. Measure 5 1/2 inches from the other side, also making a mark. At each mark, draw a 3-inch pencil line that is perpendicular to the long side. This will serve as a guide for the preschoolers to cut. Have the kids cut along the pencil lines. This will create a tab in the paper. 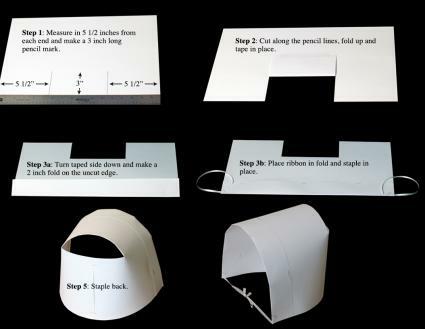 Fold the tab back against the sheet of paper and tape in place. Turn the paper over so the taped tab is on the bottom. Help the kids fold the opposite long edge (the one they didn't cut) back about 2 inches. Slide one of the ribbon pieces into the crease of the fold you just made. Adjust so the ends are even. Staple along the folded edge to close it. Staple through the ribbon at each corner to hold it in place. Carefully bend the paper, allowing the two remaining tabs in the back to overlap. Try on the bonnet and adjust the tabs so that the bonnet fits well. Use a stapler to secure the tabs to one another in the desired position. If necessary, you can trim off any excess paper. Tie the ribbon ends to secure the bonnet. Place a piece of 12 x 18-inch paper with a short side facing you. Cut off the two top corners to create a trapezoid. Fold over the top edge by about two inches. Place a piece of ribbon in the crease and staple the fold closed. Make sure the ends are even, and then staple through the ribbon to secure it. To wear the apron, just tie the ribbon ends around your waist. 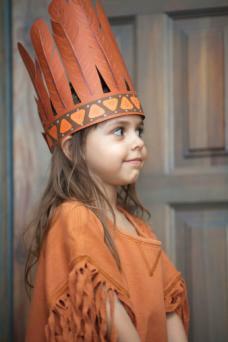 Although it's impossible to replicate the stunning craftsmanship and intricate designs of the various types of traditional Native American dress, kids can learn to appreciate the multi-cultural aspects of Thanksgiving by creating replica Native American costumes. This simple project is a great way to work on cutting skills, although some children may need adult assistance with scissors. Start by cutting basic feather shapes out of brown cardstock or paper. Vary the length of the feathers from about 8 inches to around 14 inches. Use markers to decorate each feather, adding a center line. Wrap the strip of cardstock around the child's head to get a proper fit. An adult should staple the strip to create the headband. Glue each feather to the inside of the headband so that the feathers stand up. Arrange them randomly. Stop when the entire headband is covered. If you're using a sweatshirt, cut the sleeves off about six inches from the shoulder seams. If you're using a t-shirt, trim off the rolled hem at the end of each sleeve. Use scissors to cut the remaining portion of the sleeves into fringe. Make vertical cuts about 1/2 an inch apart that extend all the way to the shoulder seam. Stop when you've gone all the way around each sleeve. Cut off the bottom hem of the shirt. Make a similar fringe all the way around the bottom. A turkey is a major fixture of any Thanksgiving celebration, and preschoolers can get in on the fun by creating their own turkey headbands. This is a simple project, but it may require a bit of adult assistance with the cutting. Start by wrapping the long paper strip around the child's head to get a good fit. Remove the strip and staple it to hold the headband in place. Have each child cut several feathers out of the various colors of construction paper. You'll need about five feathers, all roughly eight inches long. Use markers to decorate each feather. Glue the feathers to the inside of the headband, overlapping them slightly. Cut two circles out of the while construction paper, each about two inches in diameter. It may help to draw these circles on the paper ahead of time and have the kids cut along the lines. Glue the circles to the front of the headband, placing them in the same part of the headband as the feathers. Glue a googly eye to each circle. While the glue is drying, cut a two-inch square out of the red construction paper. Cut a squigly shape to be the waddle. Glue the waddle to the front of the headband, just below the turkey's eyes. Angle the waddle out to one side so it will not hang in the child's eyes. Fold the red square on the diagonal to create the beak. Glue this over the waddle. Party City - You'll find everything from detailed Native American outfits to bulk packs of pilgrim hats at Party City. Prices are reasonable, with most complete kids costumes retailing for under $30. Costume Discounters - This is a great resource for costumes for both girls and boys. You won't find any turkey costumes here, but there are lots of fantastic pilgrim and Native American options under $30. Pure Costumes - If you need something turkey-related, this is a good place to look. There are turkey hats and complete turkey costumes, as well as traditional pilgrim outfits. Turkey hats are around eight dollars, while complete costumes cost up to $50. HalloweenCostumes.com - Although they don't have a lot of pilgrim options, this resource makes up for that with a wealth of turkey costumes and Native American outfits for kids. Every Thanksgiving outfit is under $40. Costumes offer a way for kids to really appreciate the story of Thanksgiving and take on the roles that come with the holiday. They make a great addition to any preschool Thanksgiving lesson, as well as a fun way to celebrate the holiday at home.